The Tai Lue Way of Life exhibition was held on October 24 – 26 at the Lanna Traditional House Museum on Canal and Suthep, the beautiful museum is a series of traditional old stilt homes set in the gardens and belongs to Chiang Mai University. The event features Tai Lue people demonstrating weaving, cooking, umbrella painting and wooden handicrafts. Students and visitors are encouraged to visit and join in. The next Tai Lue event will be held November 26 and again in December. 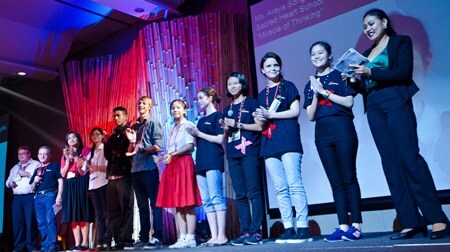 Students, teachers, the TEDxChiangMai team, and other volunteers are organizing [email protected] which will be a half-day event on Sunday, 16 November 2014 at Chiang Mai University. The highlight will be 10 - 12 students sharing their ideas onstage. TEDxChiangMai organizers have already been working with some students since August as well as a few late additions. Creative Chiang Mai, the Chiang Mai University Science & Technology Park, Microsoft, and other organizations are supporting the event. This Youth Event will be a pilot, an example, to demonstrate how relatively easy it is to organize a TEDx event and why there is so much magic about it (10,000 events around the globe organized by volunteers is an astonishing number and phenomenon). A sample of the talks include “The Miracle of Thinking”, “Letters from Fate”, “Humanize your parents, Liberate yourself”, “The Thirst for More”, “Reading Between the Notes” and many more. We are certain you will find the talks inspiring and stimulating and good examples of how and what our youth are thinking about today. The TEDx platform gives all students a global platform for their talks through the dedicated TEDx online channel for TEDx talks. Each talk is videotaped and uploaded to the TEDx Youtube site where people all over the world can view them. For teachers and students, TEDx events also provide many opportunities to create learning experiences and could be one of the highlights of a school’s annual project based work. For students it is a great personal development. Student volunteers will receive a certificate at the end of the program from the Chiang Mai University, Science & Technology Park confirming that they were volunteers for this event. Teachers and schools are invited to join in the organization and running of the event. 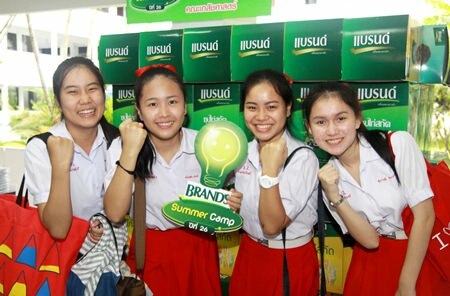 Brand Summer Camp, a tutoring project by Brand has been recognized for excellence as a tutoring program in Thailand and offered students the chance of online tutoring for six days on eight subjects broadcast from Kasetsart University Bang Khen Campus from October 21-26, 2014. The event was hld at Chiang Mai University and saw Dr. KannikaThiankhanithikun, Deputy Dean and Alumni Relations of Faculty of Pharmacy CMU preside over the opening ceremony of the project in the North. This year, students enrolled in the project more than 100,000 people nationwide. Zonta scholarship students are joined by members of Zonta International of Chiang Mai at the donation ceremony at the Red Cross Station on October 25, 2014. Zonta International Club of Chiang Mai, the international women’s organization dedicated to the betterment of women and children held their 5th annual scholarship donation ceremony at the Red Cross Station Chiang Mai on October 25, 2014. The scholarships are for students for the 2nd semester of school and saw scholarships given to students ranging from elementary to high school from San Patong, San Sai and Mae Wang. Children whose families have been affected by HIV/AIDS or are dependents of poor grandparents are the recipients of the scholarships. The ceremony was overseen by Z. Somboon Suprasert founding Chairperson of the Zonta Club Chiang Mai, Z. Jiamjit Boonsom Past President, Z. Bongkoth Tuwanondh and Z.Tiraka (Asiyah) Intrapasart, the Project Administrator. Z. Somboon Suprasert, Founding Chairperson of the Zonta Club Chiang Mai said that the idea for the project began when she was working at the Chiang Mai Red Cross Station where she saw many families affected by HIV/AIDS. When she founded the Zonta Club of Chiang Mai ten years ago they continued to project to visit AIDs patients and saw that after the parents had died many children went to live with their grandparents who struggled to put the through school. The club has organized scholarships for these affected children and over the past 5 years has donated 3,600 baht each for elementary school students and 5,000 baht each for high school level. They follow the children through their educational career, supporting them in school, eleven students have benefitted from this and the club will add seven more students for 2015. Currently, some children are near the end of Mathayomsuksa 6 and wish to study in university so the club has coordinated with Dr. Narong Chavasint, President of North-Chiang Mai University to provide seven scholarships for studies in the Faculty of Engineer at North-Chiang Mai University.